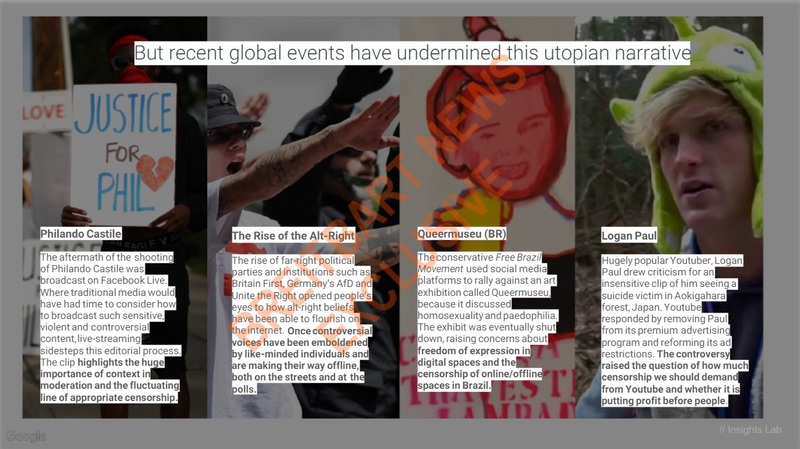 A leaked internal document from Google shows Big Tech has abandoned free speech in favor of censorship in order to suppress various nationalist movements in America and Europe. 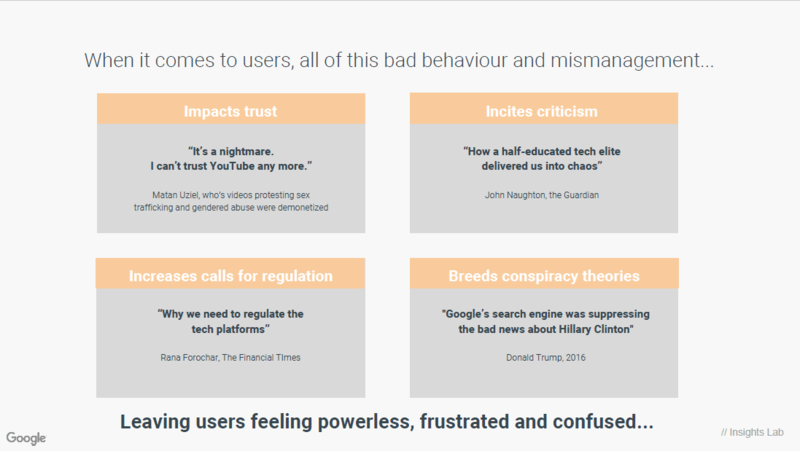 Though Google loves to outright lie and claim they have no political bias in their search algorithms, the document just openly admits that they and other major tech companies are censoring free speech to stop "bad behaviour," which they refer to, among other examples, as the rise of nationalism and trolling of celebrities by right-wingers. They even say their censorship regime is helping them "increase revenues" from advertisers! An internal company briefing produced by Google and leaked exclusively to Breitbart News argues that due to a variety of factors, including the election of President Trump, the �American tradition� of free speech on the internet is no longer viable. Despite leaked video footage showing top executives declaring their intention to ensure that the rise of Trump and the populist movement is just a �blip� in history, Google has repeatedly denied that the political bias of its employees filter into its products. 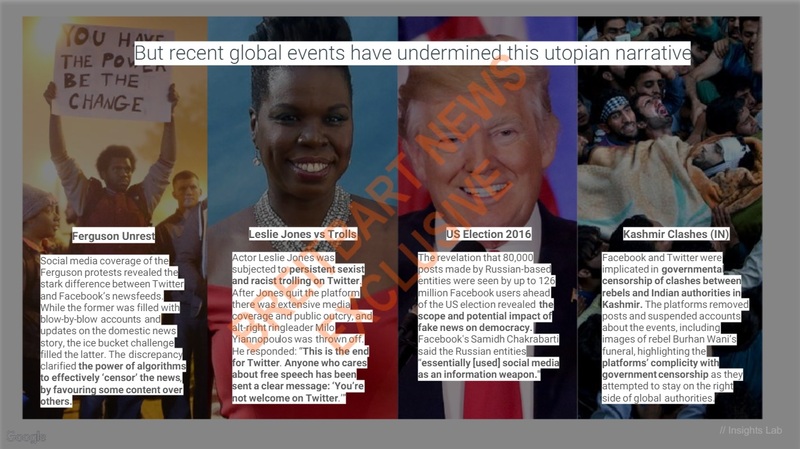 But the 85-page briefing, titled �The Good Censor,� admits that Google and other tech platforms now �control the majority of online conversations� and have undertaken a �shift towards censorship� in response to unwelcome political events around the world. P11 � The briefing identifies Breitbart News as the media publication most interested in the topic of free speech. P15 � Section 230 of the Communications Decency Act is linked to Google�s position as a platform for free expression. 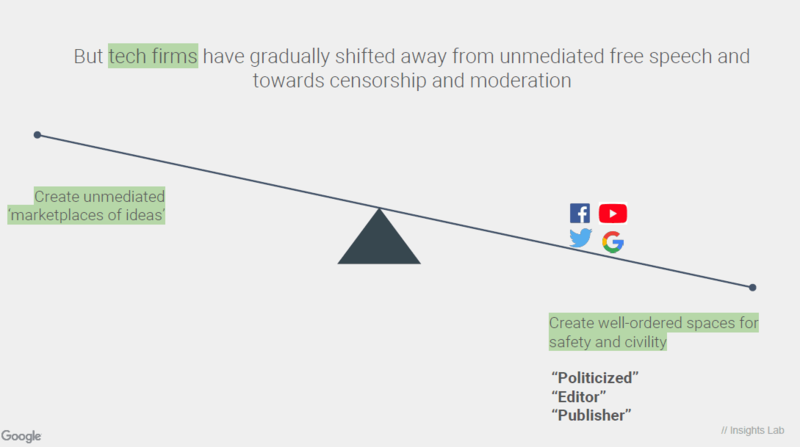 Elsewhere in the document (p68), Google and other platforms� move towards moderation and censorship is associated with the role of �publisher� � which would not be subject to Section 230�s legal protections. PP19-21 � The briefing identifies several factors that allegedly eroded faith in free speech. The election of Donald Trump and alleged Russian involvement is identified as one such factor. The rise of the populist Alternative fur Deutschland (Alternative for Germany) party in Germany � which the briefing falsely smears as �alt-right� � is another. PP26-34 � The briefing explains how �users behaving badly� undermines free speech on the internet and allows �crummy politicians to expand their influence.� The briefing bemoans that �racists, misogynists, and oppressors� are allowed a voice alongside �revolutionaries, whistleblowers, and campaigners.� It warns that users are �keener to transgress moral norms� behind the protection of anonymity. 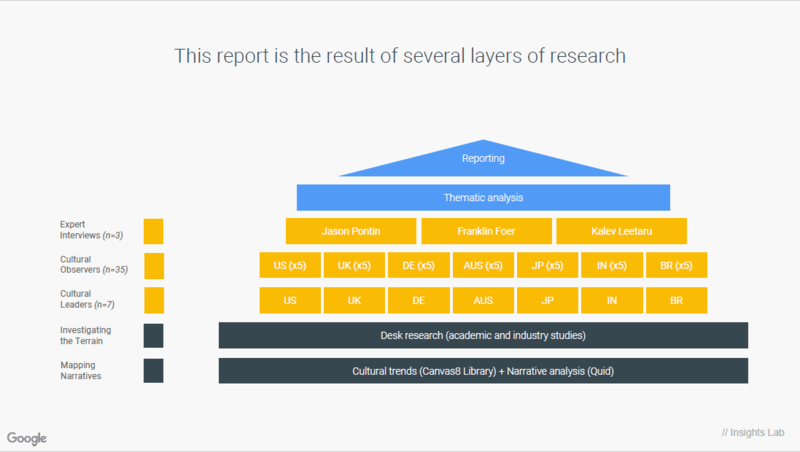 P37 � The briefing acknowledges that China � for which Google has developed a censored search engine � has the worst track record on internet freedom. P45 � After warning about the rise of online hate speech, the briefing approvingly cites Sarah Jeong, infamous for her hate speech against white males (Google is currently facing a lawsuit alleging it discriminates against white males, among other categories). P49 � The document accuses President Trump of spreading the �conspiracy theory� that Google autocomplete suggestions unfairly favored Hillary Clinton in 2016. (Trump�s suspicions were actually correct � independent research has shown that Google did favor Clinton in 2016). 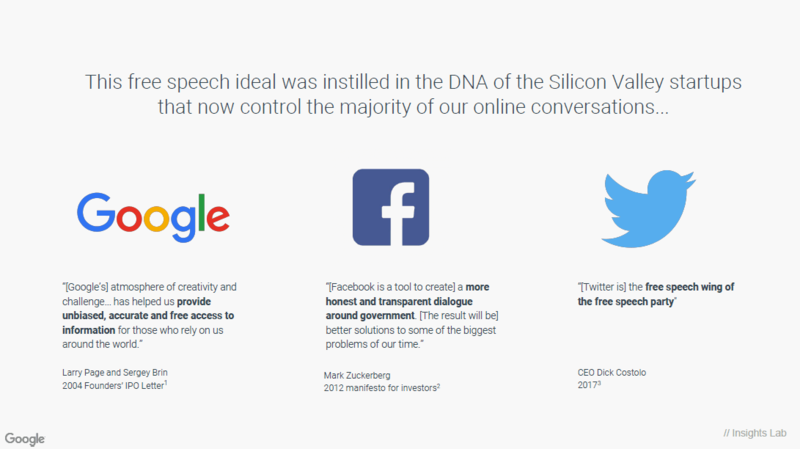 P53 � Free speech platform Gab is identified as a major destination for users who are dissatisfied with censorship on other platforms. P57 � The document juxtaposes a factoid about Russian election interference with a picture of Donald Trump. P63 � The briefing admits that when Google, GoDaddy and CloudFlare simultaneously withdrew service from website The Daily Stormer, they were �effectively booting it off the internet,� a point also made by the Electronic Frontier Foundation and the FCC in their subsequent warnings about online censorship. P66-68 � The briefing argues that Google, Facebook, YouTube and Twitter are caught between two incompatible positions, the �unmediated marketplace of ideas� vs. �well-ordered spaces for safety and civility.� The first is described as a product of the �American tradition� which �prioritizes free speech for democracy, not civility.� The second is described as a product of the �European tradition,� which �favors dignity over liberty and civility over freedom.� The briefing claims that all tech platforms are now moving toward the European tradition. P74-76 � The briefing warns that concerns about censorship from major tech platforms have spread beyond the right-wing media into the mainstream. Note too, they also say the Arab Spring -- which led to the rise of ISIS -- was the "high point" of the "power of digitalised free speech!" That was a color revolution pushed by Western intelligence agencies which totally destabilized the Middle East and led to the rise of ISIS and the refugee crisis!